The ideal time for your stay abroad is between the ages of 14 and 17. More and more exchange students are choosing to finish their High School in New Zealand and stay longer than 1 year. Finishing High School in New Zealand (the NCEA 3) opens the pathway into university and work opportunities later on. 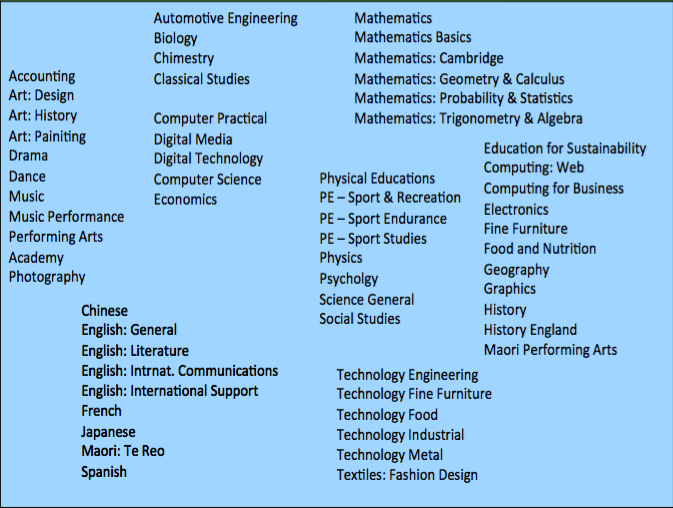 THE NCEA system of New Zealand High Schools is different to many other countries. It offers a variety of different subjects and allows for individual choice according to strengths, future planning and interests. The learning environment is compelling. Beside classical subjects such as English and mathematics you can choose subjects like photography, theater, gardening or graphic design. Six to seven courses are to be chosen per quarter, four of which are compulsory. Up to three courses can be chosen freely. There are options for specifically talented students as well (Cambridge mathematics etc.). Modern equipment in classrooms and well-stocked libraries are being provided to support students. In addition there is a wide range of additional sporting and artistic activities to broaden the skill set and set a balance to academic studies.